People everywhere are living longer, according to the “World Health Statistics 2014” published today by WHO. Based on global averages, a girl who was born in 2012 can expect to live to around 73 years, and a boy to the age of 68. This is six years longer than the average global life expectancy for a child born in 1990. WHO’s annual statistics report shows that low-income countries have made the greatest progress, with an average increase in life expectancy by 9 years from 1990 to 2012. The top six countries where life expectancy increased the most were Liberia which saw a 20-year increase (from 42 years in 1990 to 62 years in 2012) followed by Ethiopia (from 45 to 64 years), Maldives (58 to 77 years), Cambodia (54 to 72 years), Timor-Leste (50 to 66 years) and Rwanda (48 to 65 years). Wherever they live in the world, women live longer than men. The gap between male and female life expectancy is greater in high-income countries where women live around six years longer than men. In low-income countries, the difference is around three years. 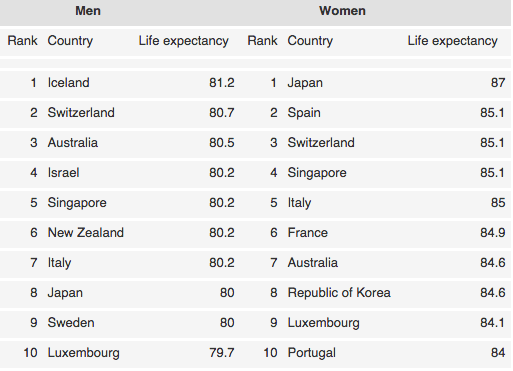 Women in Japan have the longest life expectancy in the world at 87 years, followed by Spain, Switzerland and Singapore. Female life expectancy in all the top 10 countries was 84 years or longer. Life expectancy among men is 80 years or more in nine countries, with the longest male life expectancy in Iceland, Switzerland and Australia. “In high-income countries, much of the gain in life expectancy is due to success in tackling noncommunicable diseases,” says Dr Ties Boerma, Director of the Department of Health Statistics and Information Systems at WHO. “Fewer men and women are dying before they get to their 60th birthday from heart disease and stroke. Richer countries have become better at monitoring and managing high blood pressure for example.” Declining tobacco use is also a key factor in helping people live longer in several countries. The top three causes of years of life lost due to premature death are coronary heart disease, lower respiratory infections (such as pneumonia) and stroke. Worldwide, a major shift is occurring in the causes and ages of death. In 22 countries (all in Africa), 70% or more of years of life lost (due to premature deaths) are still caused by infectious diseases and related conditions. Meanwhile, in 47 countries (mostly high-income), noncommunicable diseases and injuries cause more than 90% of years of life lost. More than 100 countries are transitioning rapidly towards a greater proportion of deaths from noncommunicable diseases and injuries. Around 44 million (6.7%) of the world’s children aged less than five years were overweight or obese in 2012. Ten million of these children were in the WHO African Region where levels of child obesity have increased rapidly. Most deaths among under-fives occur among children born prematurely (17.3%); pneumonia is responsible for the second highest number of deaths (15.2%). Between 1995 and 2012, 56 million people were successfully treated for tuberculosis and 22 million lives were saved. In 2012, an estimated 450 000 people worldwide developed multi-drug resistant tuberculosis. Only one-third of all deaths worldwide are recorded in civil registries along with cause-of-death information.